The bee louse, Braula coeca Nitzsch, is a wingless fly that lives as a commensalist in western honey bee, Apis mellifera Linnaeus, colonies. Biology of Braula has been studied irregularly since the 1920s. Braula is presumed to be harmless to its host, though this point is debatable, and some countries recommend Braula control. However, Braula probably poses a minimal threat to the beekeeping industry because no economic damage can be attributed to it. Figure 1. An adult Braula coeca on the dorsal aspect of a worker honey bee, Apis mellifera Linnaeus, thorax. Photograph by The UF/IFAS Honey Bee Lab. Braula has an extensive global distribution, being documented in Africa, Asia, Europe, Australia (Tasmania), North America, and South America (Smith and Carron 1985). The species probably was brought into the United States on imported honey bee queens, although the exact year is unknown (Philips 1925). Figure 2. 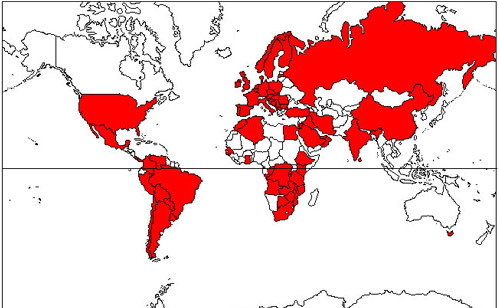 The worldwide distribution (red colored areas) of the bee louse, Braula coeca Nitzsch. Graphic by Ellis and Munn 2005. Eggs: Eggs are white, oval shaped, and have two lateral flanges. The flanges are flat and extend parallel to each other toward the long axis of the egg. The eggs range from 0.78 - 0.81 mm in length and 0.28 - 0.33 mm wide excluding the flanges, and average 0.84 × 0.42 mm (l × w) with the flanges. Larvae: The larvae are maggot-like in appearance, with the posterior end appearing flattened, while the anterior end is pointed. Bee louse larvae are very small and difficult to see with the unaided eye. A diagnosis usually is made based on comb damage. Pupae: The pupae are white/yellowish and range from 1.4 - 1.7 mm in length and 0.5 - 0.75 mm wide. Adults: Adult Braula are < 1.5 mm long and covered in spine-like hairs. They do not have the wings or halteres possessed by most flies. Braula are reddish-brown in color and regularly are misdiagnosed as varroa mites, Varroa destructor Anderson and Trueman, due to their similar appearance. One notable difference useful as a field diagnosis to distinguish between varroa mites (mites) and Braula (insects) is that Braula,have six legs while adult varroa mites have eight legs. 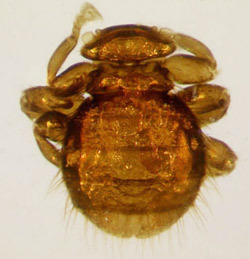 Further, the adult Braula has a rounded appearance while varroa mites are more compressed and oval. Despite these differences, both are very small and difficult to distinguish with the unaided eye. Figure 3. Dorsal views of an adult bee louse, Braula coeca Nitzsch, (left); and an adult varroa mite, Varroa destructor Anderson and Trueman, (right). Varroa mites are more oval in shape, and have eight legs as compared to the bee louse, which has six legs. 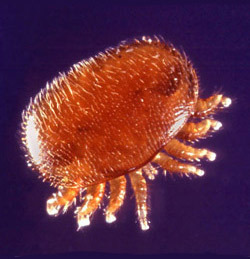 Photograph of bee louse by University of Florida; photograph of varroa mite by Scott Bauer, USDA. The eyes of adult Braula are located just above the antennae. They appear as pale spots on the surface of the cuticle and are surrounded by pigmented chitinous rings. The terminal joint the 5-segmented tarsus is divided and modified with comb-like teeth, an adaptation that allows the fly to cling to the hairs of honey bees. The thorax is very short, less than half as long as the head, and often is mistaken for an abdominal segment. The scutellum is absent. Figure 4. 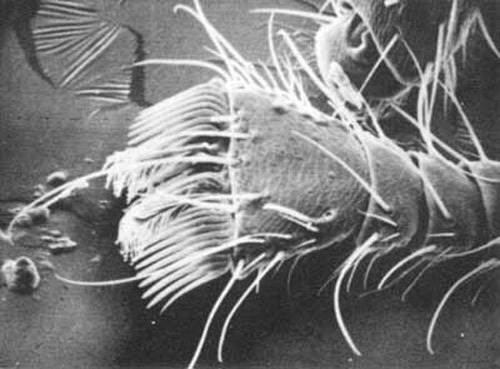 A scanning electron microscope photograph of a dorsal view of a tarsus of the bee louse, Braula coeca Nitzsch, showing the comb-shaped row of spines, or claw, important in clinging to the branched hairs of the honey bee, Apis mellifera Linnaeus. Photograph by W.J. Humphreys, University of Georgia. 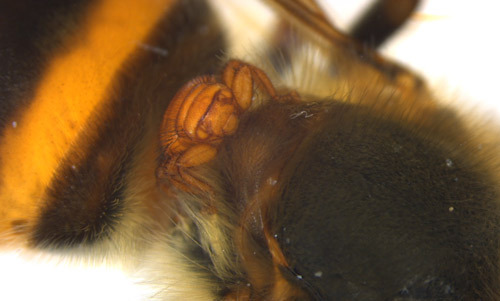 Braula adults often are found on the heads of honey bee workers, drones, and especially queens. While on the head of its host bee, Braula will feed on food from the mouth of its host as the host is fed by another bee or is feeding another bee. There is some evidence that adult Braula can induce regurgitation from bees by stroking the upper edge of a bee's labrum until the bee extends its tongue. Then the Braula feeds on food or other secretions that the bee offers. Female Braula can oviposit many places in the hive (empty cells, brood cappings, debris on the floor) but only eggs oviposited on honey cappings will hatch. Egg incubation periods range from 2 to 7.4 days, depending on the season. Upon emergence from their eggs, Braula larvae construct a tunnel under the cell cappings. This visible tunnel is the most noticeable hive damage attributed to Braula. Although some consider this damage, it is only aesthetic damage and of minor economic importance. Regardless, the intersecting tunnels are a common sign of Braula infestation. It is believed that Braula larvae feed on honey and pollen residues encountered while tunneling under the cell cappings. Larvae of the Braula undergo three developmental instars. These range from 7.1 to 10.8 days in length. After completing the third instar, the larvae develop into prepupae, a stage that can last from 1 to 2.7 days. During this time, the prepupa has a creamy-white appearance and is enclosed in the larval skin. The life cycle begins again as the adult Braula emerges. Braula probably poses a minimal threat to the beekeeping industry because no economic loss can be attributed to its damage. There are very few recommendations for Braula control, largely because it is not considered a major honey bee pest. Morse RA, Flottum K. (eds.) 1998. Honey Bee Pests, Predators, and Diseases. 3rd edition. A.I. Root Company, Medina, Ohio. 718 pp. Philips EF. 1925. The bee-louse, Braula coeca in the United States. U.S.D.A. Circular 334. Smith Jr. IB. 1978. The bee louse, Braula coeca Nitzsch, its distribution and biology on honey bees. Unpublished MS thesis, University of Maryland. 111 pp. Smith Jr. IB, Caron DM. 1985. Distribution of the beelouse, Braula coeca, in Maryland and worldwide. American Bee Journal 125: 294-96. Publication Date: April 2010. Reviewed: March 2019.